Cook pasta according to package instructions. Drain and keep warm. Warm Pasta Sauce over medium low heat for 3-5 min, stirring occasionally. Meanwhile, brush salmon with 1 Tbsp. of oil and sprinkle with seasoning. Heat remaining 1 Tbsp. of oil in a large skillet over medium heat. 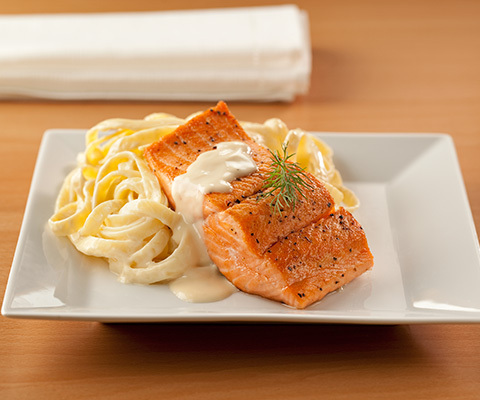 Cook salmon for 4 to 6 minutes on each side, or until salmon flaskes easily with a fork. To serve, toss cooked pasta with 1 cup of warm Pasta Sauce and divide between 4 plates. Place salmon on top and serve with remaining Pasta Sauce. If desired, substitute Classico® Sun-Dried Tomato Alfredo Pasta Sauce with Classico® Four Cheese Alfredo Pasta Sauce. The salmon will be dry if cooked as directed. It should be cooked no more than 3 min. per side.